Each place around this globe has something unique to offer for the people who are visiting their country for a vacation and/or for a different getaway. Here in the Philippines, we have our rich culture, we also offer numerous foods that's kind of rare, which made us more famous when it comes to preparing food of different varieties. One dish that caught my attention is the so-called 'Kinilaw' or the raw fish marinade in vinegar. 'kinilaw' literally means to cook in vinegar. This Filipino food can be found in almost every Filipino restaurant located in Mindanao, especially in General Santos City in southern Mindanao also known as the Tuna Capital of the Philippines. Only the vinegar will eventually cook the fish meat, not actually cook it, but soaking the fish meat for a couple of hours, the acid content of vinegar will make the meat so opaque, giving it the look and texture of a cooked fish. Aside from vinegar, other ingredients are ginger, calamansi juice or the local lemon, tiny chilies we call siling labuyo or cayenne peppers, coconut milk, onions and dayap or a green lemon-like fruit, which gives it the rare sour but fruity taste. This Filipino recipe totally depends on who is preparing it, some uses mayonnaise as a substitute if coconut milk is not available. So feel free to experiment, but do it only on a small scale of ingredients, so won't have to worry about spoiling the whole thing. The vinegar serves as the cleaning agent and preservative in one. 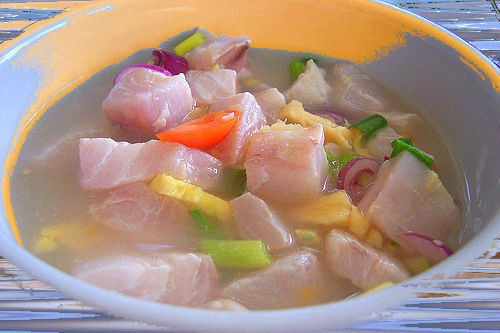 Almost any kind of seafood can be prepared as Kinilaw as long as the seafood is fresh, and use only fresh fish for best result, because frozen fish will only give unpleasant odor and taste. In Meto Manila, they usually use Spanish mackerel, Yellow fin Tuna, or even Milkfish, since the fish mentioned are quite expensive, some prefer to use Anchovy (dilis) for making Kilawin. So let's get ready to make one no-cook meal, this time we will use the best possible fish meat available in the market, Tanigue. This is a white meat fish, it is the best substitute for tuna, and it's also affordable, so if you want to save some money but don't want to compromise the quality, this one's the right choice for you. Dice the Tanigue meat and then wash with vinegar. Put in rock salt when meat turns opaque, mix thoroughly to remove strong fish odor then chill it for about an hour or 2. When you think the fish meat is soaked enough, mix all the vegetables in a bowl. Put in rock salt and pepper. Once washed, fish meat is chilled, drain the vinegar and salt solution and mix in the vegetables. Now, put another fresh batch of vinegar and squeeze in half of the lemon. Toss the ingredients together. Place lemon wedges on at the sides before serving. Chill again before serving. Kinilaw is a popular appetizer in our country, and is more popular among drinking sessions, consumed as 'pulutan'. The beer match kinilaw is made with extra chillies that gives it a strong kick which our beer buddies really dig. This is a must try recipe, specially if you don't like oily foods, it's also a healthy choice, just be careful with the preparation, and always keep in mind to use only the freshest ingredients to give your kinilaw the best taste ever. Do you have another way of preparing Kinilaw? Please share it with us.